Deep in the Andes region of Northern Peru, in the province of Celendin, Cajamarca, the once peaceful existence of rural campesinos and indigenous people who call these mountains home, is under threat. Having endured a long history of colonisation, first at the hands of the Incas and centuries later by the Spanish, once again the people of this region are summoned by ‘la lucha’, for the preservation of human dignity, democracy and their traditional way of life. The return of unwelcome strangers to this land, in the form of Newmont Mining Corporation and the IFC (a branch of the World Bank) supported by one of Peru’s wealthiest families and their private company Buenaventura, all combine under the banner of Yanacocha to search these hills for gold. Utilising an aggressive form of open pit mining and earth destroying techniques. Bringing with them violent repression, environmental degradation and death. Cajamarca is already home to the largest gold mine in the world, in operation since 1994. The company has plans for a new mega mine, ‘Conga’ in the province of Celendin – the focus of this article. Since 2012, the $4.8 billion project is currently suspended, while the state enacts anti democratic laws infringing the right to peaceful assembly and social protest. Meanwhile opposition to the mine continues to grow locally and regionally, with links firmly established trans-globally between communities negatively impacted by the extractive industry. The ‘Conga’ project aims to destroy the head of the water basin for the province, and in part that of neighboring Cajamarca and Hualgayoc, resulting in severe water shortage and contamination. The traditional way of life here consists mainly of subsistence farming and local trade dependent on a scarce water supply. Human Rights Defenders raise the concern that in addition to ‘four lakes being dried up, 27 lagoons, 700 springs, 60 watering channels, 80 drinking water systems and 214 wetlands will disappear.’ Resulting in disastrous consequences for the environment, violating the serenity of these mountain tops, and threatening to eliminate the only natural source of water in the region. Thus, the very essence of life itself. The local communities have ‘denounced the lack of consultation on mining projects and irregularities in the appropriation and transfer of communal land.’ Although, it may be true that few locals will benefit from the mine, the promise of short term jobs for the immediate community is often a mirage. What is true, is many families will be displaced and inequality will grow. Despite the presence of mining activities in Cajamarca for the last 20 years, 51.9% of the population lives in poverty, the highest poverty rate in the country. During the lifetime of this, the largest gold mine in the world, Cajamarca has risen in the tables from fourth position to the first most impoverished province in Peru – res ispa loquitur. Frontline Human Rights Defenders (FHRD) note the existence of a 2009 decree in their 2014 report on Peru, granting off-duty policemen license to provide ‘extraordinary additional services‘ to the private sector and be remunerated directly by the company. In fact, this decree allows ‘extraordinary additional services’ to be agreed between the company and the police force itself, on such occasions where the company may request additional services. The relationship between police and the companies involved is compounded further by the reported use by police of means and resources, including vehicles, provided by these companies. Thus, even the merest illusion of police impartiality in this conflict is definitively laid bare. A strategy of instigating legal cases against protestors and community leaders best described by FHRD as ‘frivolous’ or ‘unfounded in nature’ rather than a ‘genuine violation of the law’ is tactically applied during this conflict. Mr. Milton Sanchez, Secretary General of the Plataforma Interinstitucional Celendina has received 50 charges, yet has not been convicted once. This strategy requires its targets, such as Mr Sanchez, to travel far from their domain to attend hearings in Chicaylo, and other locations scattered throughout the region. More specifically, it requires the target to engage legal representation at his own expense and generally aims to tie up the individual with a highly stressful workload to prevent him or her from fulfilling regular activities accrued as a member of a healthy civil society. One charge laid against Mr. Sanchez is that of ‘psychological damage’, allegedly inflicted by him against the mining company, during the community led campaign against the project. As General Secretary of the community Plataforma, Mr. Sanchez exercised his democratic rights to freedom of expression, freedom of association and freedom of assembly. These fundamental rights, the corner stone of any legitimate democracy, are guaranteed under several international treaties including Inter American Convention of Human Rights, International Covenant on Civil and Political Rights (ICCPR), International Covenant on Economic Social and Cultural Rights (IESCR), and the Universal Declaration of Human Rights. 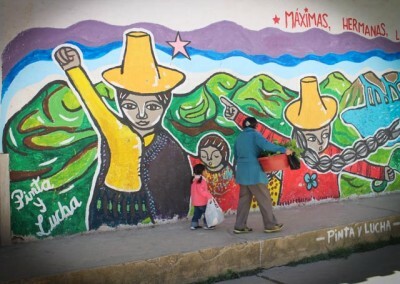 On 5 May 2014, The Inter American Commission of Human Rights placed ‘precautionary measures‘ which explicitly amount to protective measures, on 46 human rights defenders and leaders of the farming communities and the Rondas Campesinas of Cajamarca. Designed to ‘prevent irreparable harm to persons or to the subject matter of the proceedings in connection with a pending petition or case.’ This applies to Mr. Sanchez, and Mrs. Maxima Acuna Chaupe and her family, who are engaged in a dispute over ownership of her land with the company. Mrs. Chaupe had previously suffered an attempt of forced displacement, acts of violence at the hands of the police, her house was destroyed, sheep killed and children attacked. On 22nd May 2014 the deadline for the Peruvian government to respond to these orders passed without acknowledgement . This community has already paid too high a price for exercising its ostensible civil and political rights to freedom of expression and freedom of assembly. Peru is a party to the ICCPR and ICESCR. The rights enshrined within these Covenants are derived from the inherent dignity of the human person, recognizing the ideal of free human beings enjoying political freedom and freedom from fear and want. Article 21 of the ICCPR stipulates ‘the right to peaceful assembly must be recognised.’ Yet, both in the hillside and in the town of Celendin, peaceful protest has been met with violent repression. In November 2011, during a mass mobilization of civil society groups and individuals who assembled in defense of their fresh water lagoons, 19 peaceful protestors were seriously injured when the police and military opened fire with live ammunition, plastic bullets, and tear gas. Following an erroneous report of six deaths during the incident, transmitted down from the mountain via radio, the mining office in Celendin was burned out in reprisal. In 2012, four peaceful protestors tragically lost their lives in Celendin town centre, and another in nearby Bambamarca, when fired upon indiscriminately by police and military with live ammunition. Prosecutions of those responsible have not taken place. Inscribed on a downtown murial in Celendin are the names; Faustino Silva, Joselito Sanchez, Joselito Vasquez, Paulino Garcia and Cesar Medina. Forever remembered in the hearts and minds of the community. ‘Conga No Va !’ continues to be the cry heard along the hillside.